Over the past decade, Beyond the Welfare State? has become established as the key text on the emergence and development of welfare states. It offers a comprehensive and remarkably well-informed introduction to the ever more intense debates that surround the history and, still more importantly, the future of welfare in advanced industrialised states. Comprehensively revised and re-written, this third edition of the book embraces all of the most important theoretical and empirical developments in welfare state studies of recent years. Working within an explicitly comparative framework, the book draws on a wealth of international evidence to survey what are now the most pressing issues surrounding the future of welfare: among them, globalisation, demographic change, declining fertility, postindustrialism and immigration. It draws extensively on the explosion of work on welfare states that has emerged within the North American political science community over the past ten years as well as giving detailed attention to developments with the UK, continental and northern Europe and beyond. Beyond the Welfare State? remains the most comprehensive and up-to-date guide to the complex of issues that surround welfare reform. It is required reading for anyone who wants to come to terms with what is really at stake in arguments about the future of welfare. 7 Beyond the Welfare State? "Students thirsty to understand the wider dimensions of welfare state policy would do well to turn to Beyond the Welfare State? Its sweep is wide, it is well-ordered and up to date. Most welcome of all, it is clear." 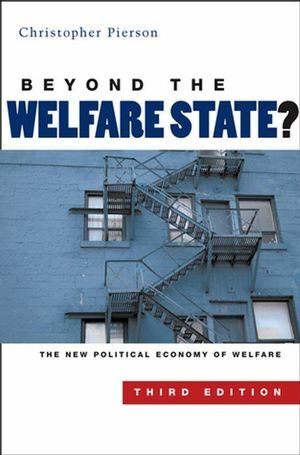 "Beyond the Welfare State? draws on a careful and exhaustive review of both the theoretical literature and empirical evidence on the contemporary Western welfare state and social democracy. Pierson's overview of the forces that propelled comparative welfare state development, crisis, and change is masterful, critical, and balanced. Packed with fresh insights and sharp reasoning, the book manages to pull together what it is important to know in the field of comparative welfare state studies. It is just about the best review of the literature currently available – a perfect text for upper-level university courses." "Given the complexity of modern welfare states and the plethora of opinion surrounding them, attempting to give a theoretically rich and empirically comprehensive accounting of both the state of contemporary welfare states and the state of theory about them seems an impossible task. Yet this is exactly what Christopher Pierson has achieved. Combining a detailed multi-country historical overview with a theoretical summary that is essential reading for anyone wishing to understand the real "state" of the modern welfare state, Beyond the Welfare State? is a tour de force of comparative analysis." Third edition of an established key text on the welfare state. Offers comprehensive and remarkably well-informed introduction to classic and contemporary debates, as well as the future of welfare. Draws on an international range of examples and literature, including US, continental and northern Europe. Fully revised to take account of most recent ideas and evidence, with attractive new cover design. Can be used in conjunction with the second edition of Pierson and Castle’s reader on the welfare state.